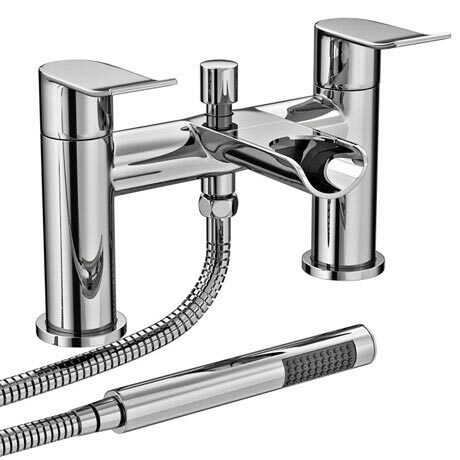 The designer Luna waterfall bath shower mixer has an open spout, creating a beautiful waterfall effect, complemented by lever handles that gives finger tip control of the temperature and flow of water into the bath. Includes the handheld shower head, wall bracket and the flexible hose. This is great quality product, bought this for a new bathroom refurbishment I went for. Looks high quality and ergonomically designed, do not be deceived by the look of the shower head it really works well. Bought this one to match with my Luna sink tap! Looks strong, solid, high-quality! Absolutely love it! Although not yet fitted quality is good and will add a posh touch to our new bathroom!